I arrived home early from work this afternoon, and have been walking around in pajamas ever since. (No, that's not the weird part.) My PJ's currently consist of a t-shirt, a long-sleeved flannel shirt, long "sleeping pants," and a pair of socks. And I've been wearing all of these clothes despite the fact that the heat is on, and despite the fact that I've been wrapped up in a blanket for hours. Notwithstanding all of these warming efforts, I wasn't quite able to shake my chilliness. So, I decided to settle in for a bit of TV watching (AKA homework procrastination) and to make a conscious effort to stop worrying about it. After all, it is like -5 degrees outside! Thus, it wasn't until CH called that I made a discovery. "Whatcha up to?" he asked over the phone. "Not much," I replied. "Just walking around wrapped up in a blanket." "Heh. Did you know it's snowing again?" he inquired. "Nope, but I heard on NPR we were supposed to get a couple of inches tonight," I said, walking over to our bedroom window to take a quick peek outside. It was then that I saw it. Glaring back at me was what appeared to be a tiny crack in our window. It was protruding from the side of a poster that I had taped up nearly a year ago, and had actually forgotten about. The face of the poster is directed outside, and it's so old that its color has completely faded to black and white. The poster is of Barack Obama. As I talked to CH, I noticed that the crack was much bigger than I had initially thought. I also noticed that I was even colder than before. I immediately began removing the poster, finding that the crack was so deep that it went all the way through the window, and had split into several different directions. When I glanced down to the ground below (we're on the second floor), I saw a trail of 3 sets of footprints leading to just below our apartment window. And ya know what? We don't even live near the sidewalk, the road, or even the entrance to our building. Now, I realize that this isn't the end of the world; our window can certainly be repaired. The thing that bothers me is that someone had the gall to break our bedroom window in the first place. And it doesn't help that I feel like it was a direct response to our support for Obama. Since when did attempting to silence those opinions that we disagree with become a sign of democracy? CH's uncle, SH, recently spent a weekend canvassing for Obama in Georgia. SH said that he was going door-to-door through various neighborhoods when he came upon a house that he wasn't sure if he should enter. When SH knocked on the door, an elderly African American man wearing a face mask and using a respirator answered. 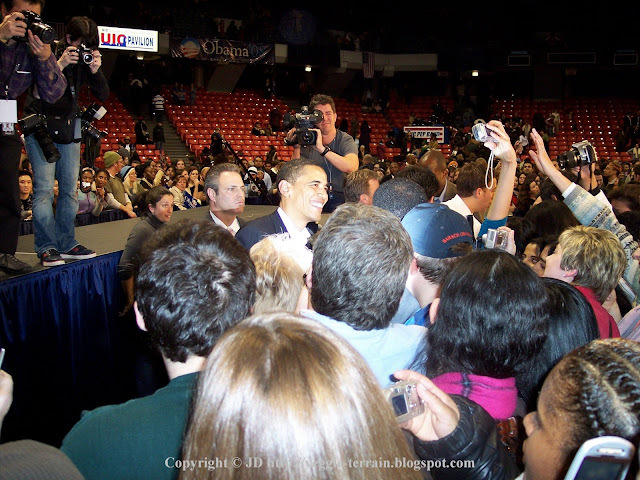 The man asked what SH wanted, and he explained that he was there to campaign for Obama, but that he didn't want to bother the man if he was too ill. Surprisingly, instead of turning him away, the man insisted that SH stay, and invited him into his home for a cup of coffee. The old man explained that he had received several injuries from fighting in the Korean war, where he had also earned a Purple Heart. He then confessed that on most days, when he looked down at his injured legs, he wondered why the hell he had ever fought for this country in the first place. "Now I know why," he began. "I never thought I'd see the day when a young white man would come to my home asking me to vote for a black man for President." I'm sorry to hear it's cold. =( I hate the cold, and it sounds like getting into PJ's is a way to get comfy! I live in my PJ's when I'm at home. I can't believe someone would throw a rock at your window simply because you support Obama. It's simply ignorance and intolerance that lead to such behavior. I'm truly sorry that someone had to stoop so low to do such a thing. That is really sad about the window, and even sadder the reason. Glad I saw your post though... reminds me to go read up on the candidates. I need to do early voting for the Texas primary (which actually looks like it may help decide the race for once!). Oh FFS - they broke your window over an Obama sign? In Illinois? I bet they don't even know he's our senator, the dolts. I wish I could say I am surprised, but I'm amazed that my car hasn't been vandalized yet over my Farm Sanctuary license plate holder. What a great post. I'm shocked that someone would break a window over an Obama poster - that's sad for several reasons - but that story with the old man was nice. obama-haters... how obnoxious. But your story about the old man was really inspiring! I am supporting Obama.. I hope he chooses Edwards as his VP.